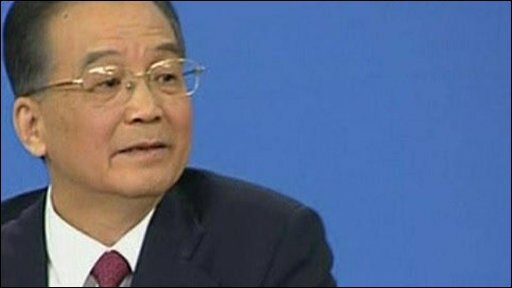 Wen Jiabao: "We are concerned about the safety of our assets"
China is ready to introduce new economic stimulus measures "at any time", Premier Wen Jiabao has said. He said there was enough "ammunition" to add to the 4tn yuan ($586bn; £421bn) package already announced. He was speaking at the end of China's annual parliamentary session - the only time he takes questions from reporters. Although Mr Wen said he expected China and the rest of the world to be better off in 2010, he said the government was ready to face tougher times. "We have prepared contingency plans to handle greater difficulties," he said. "We have prepared enough ammunition and we can launch new economic stimulus policies at any time." Opening the annual session of the National People's Congress nine days ago, Mr Wen had said that this year would be the most difficult China has faced this century. He said confidence was "more important than gold or money" in overcoming the world's financial troubles. "Only when we have confidence can we have courage and strength, and only when we have courage and strength can we overcome difficulties." But Mr Wen said he was worried about the safety of the huge amount of China's foreign-exchange reserves invested in US government bonds. "I'd like to take this opportunity here to implore the United States... to honour its words, stay a credible nation and ensure the safety of Chinese assets," he said. Almost half of China's $2tn in currency reserves is thought to be invested in US treasury bills and other government-affiliated notes. Official figures released this week showed that Chinese exports plunged by more than a quarter in February from a year ago, to $64.9bn, and imports fell by 24.1% to $60.1bn. The Chinese government is targeting annual growth of 8% and wants to boost consumption and raise consumer demand. Mr Wen also gave more details of the government's economic $586bn stimulus programme, which was announced in November. China's state-run news agency Xinhua reported that Mr Wen said the package had been "misunderstood" - emphasising that $173bn of it would be entirely new investment. That portion would be spent on "public welfare, technological innovation, environmental protection and infrastructure projects", he said. Although most of the carefully managed press briefing focused on the economy, Mr Wen did field two questions about Tibet. He brushed aside remarks earlier this week by the Tibetan spiritual leader, the Dalai Lama, that China had made life in the Himalayan region "hell on earth" for his people.